If you would like to place an order, please contact our Sales Team for an invoice! 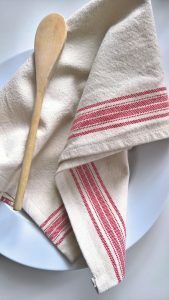 This classic style kitchen towel is made of strong cotton fabric and accented with two rustic stripes in either black, blue or red. If you want something a bit more stylish than plain cotton towels, these bistro style napkins have a vintage and rustic feel. 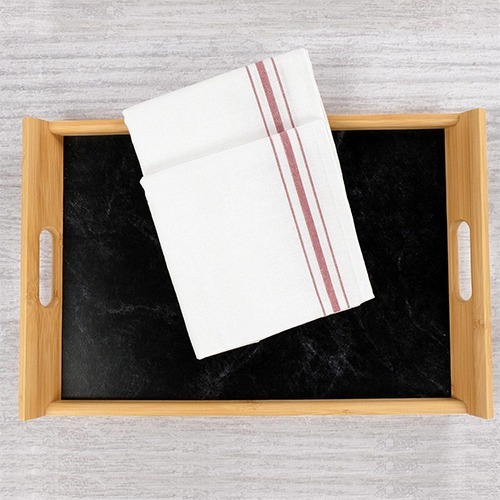 Add a classic, diner style towel to your kitchen or give as a vintage-looking gift! Cotton Creations sets the standard for functional and stylish cotton textiles; add a custom striped kitchen napkin for a contemporary look. These towels have a higher thread count and absorbency than our other lines. Although they have a snugger weave, they are not stiff or inflexible. 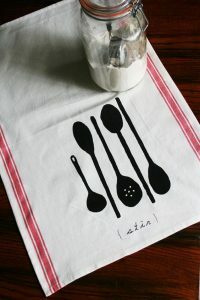 The striped Bistro flour sack towels we make are extremely versatile! We produce and inspect our towels in-house to provide both consistency and quick turnaround. When you have an important job and need a dependable tool, choose the Bistro flour sack. This towel reminds us of classic diners and being served by people on roller skates! They have been used for years and years for both décor and effective clean-up. 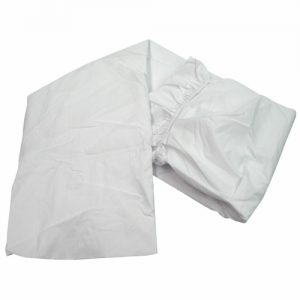 The tight weave and hemmed edges provide added durability to the construction of the cloth so it will withstand many tough tasks and heated washings. Able to absorb liquids and clean fragile surfaces like glass, our lint-free Bistro napkin works perfectly in the kitchen or in your restaurant. Using fabric towels rather than paper products is a super simple and environmentally friendly way to add sophistication to your space. Cotton Creations’ towels are washed and pressed to ensure a crisp and clean appearance, adding elegance and comfort to your bathroom, kitchen or table settings. The colored stripe on your napkin can match any kind of décor! You can also visit our Design Station to add your business logo or name. The more branding your business has, the better! Order our Bistro-style cotton napkins and make a smart investment for your business or workplace. Not only do our towels last throughout years of use, but they do not contribute to daily waste and unnecessary spending on cleaning supplies. 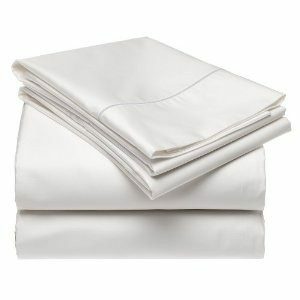 Simply toss our flour sack towels into the washing machine and you are ready for the next day’s responsibilities. This style towel with a colored stripe is a very vintage look that has worked its way through the decades. 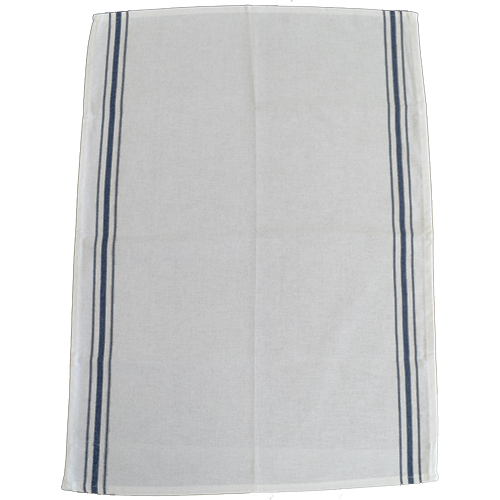 Get a custom striped bistro napkin to enhance your classic farm and country style! You will save money on single-use paper products, like napkins or paper towels, if you replace them with a handful of durable flour sack towels. If you are responsible for ordering inventory, make the smart and trendy choice: order our striped Bistro towels! Consider ordering custom striped bistro napkins in bulk and save up to 65% and enjoy free shipping on applicable orders. At home, keep these towels in the garage or with cleaning supplies where you are most likely to use paper towels. Cotton Creations makes it simple for you to save money on daily essentials, all the while reducing waste and hassle!